Götz has been producing dogs since 1950 when Marianne and Franz Götz founded Götz Puppenfabrik in Rodental. The first dolls were made of paper mache and were crafted with the help of five family members and sold directly to the public by Franz Götz. What Types of Dolls Does Götz Produce Today? Götz is a German company with an American subsidiary based in the United States. The company today is run by the second-generation of the Götz family. The first dolls were made of paper mache and were crafted with the help of five family members and sold directly to the public by Franz Götz. Götz dolls are still produced in Germany in one of the largest doll factories in the world. They produce several lines of dolls there--the hand-crafted dolls are made for play but are of high quality. They are created in association with doll artists. Each doll comes with a Götz bracelet, artist's signet, and a certificate. The Artist Edition dolls are produced in limited or one-year productions. There are play dolls which are not limited and priced for wide distribution in specialty stores (dolls such as the inventively named Mini-Muffins, Muffins, and Maxi-Muffins). Finally, Götz also produces licensed dolls such as Harry Potter dolls in Europe (see below) and their Beatrix Potter collection introduced in 2001; these dolls have clothing embroidered with Beatrix Potter themes. Dolls that have been produced by Götz range in size from miniatures by German artist Ulrike Hutt up to nearly 40-inch dolls by Indonesian artist Dwi. Is the Company Called Götz or Goetz? Both are correct; Götz is more commonly used in Germany (the official name of the company there is Götz Puppenmanufaktur GmbH) and Goetz in the USA (the official name of the US company is Goetz Dolls, Inc.). Why Is Götz Often Credited With Creating the First Modern Artist Doll? In 1965, the first original dolls of famous doll artist Sasha Morgenthaler were reproduced and distributed by Götz. This is considered by many to be the first manufactured "Artist Doll." Sasha dolls were created by Swiss Artist Sasha Morgenthaler, who was born in 1893 and died in 1975. She started to make toys and dolls in the 1920s. She progressed further and further into dollmaking, and she developed the Sasha doll which she was thrilled with because of its life-like qualities and expression, but Ms. Morgenthaler was dismayed at how costly the dolls were when she was producing the dolls in her own studio. So, in 1965 Ms. Morgenthaler teamed up Götz for mass production of the Sasha dolls. 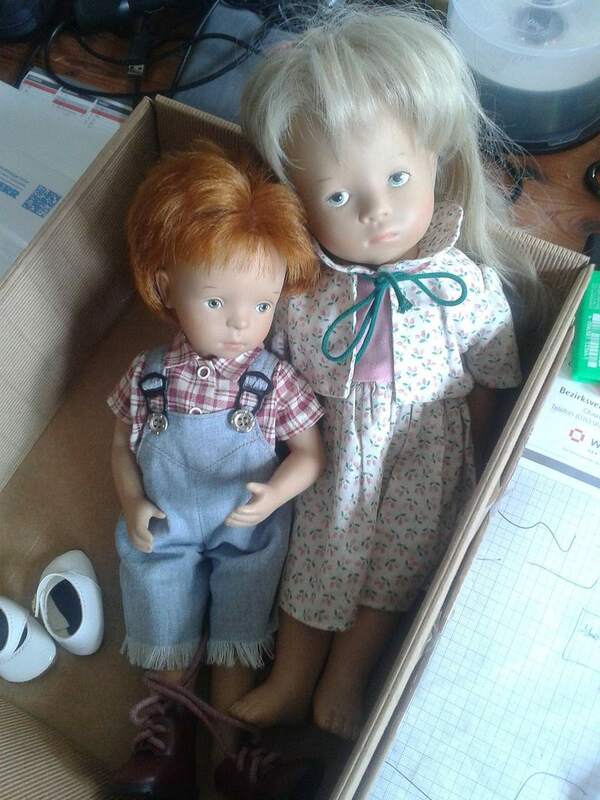 The dolls were also produced in England by Frido/Trendon starting in 1966. Götz Sasha dolls were made only until 1970, but Frido/Trendon continued until the company was bought out in 1986. Götz started making Sasha dolls again in 1995 and continued until 2001 when a difference of opinion between the heirs of the artist, Sasha Morgenthaler, and Götz on how closely the dolls should resemble the originals resulted in an end to the license contract. What Are Some Other Companies and Artists that Götz Has Worked With? In 1989, started producing collections by artists Sylvia Natterer and Carin Lossnitzer. Both artists still create dolls for Götz. In 1997, Götz started a line of children's dolls with Pampolina, a manufacturer of children's clothing in Germany. Götz also has the license to produce Harry Potter dolls in Europe (but not in the United States). Götz also works with well-known artists Hildegard Gunzel, Sylvia Natterer, Didy Jacobsen, Susi Elmer from Spain (born in Germany), Joke Grobber, Tara Heath, and many others. Did Götz Win Any 2002 DOTY Awards? Götz has won many doll industry awards, including 5 DOTY Industry’s Choice Awards in 2002. The DOTY Awards Program is sponsored by Doll Reader magazine, and it recognizes superior achievement in doll creation. The winning 2002 DOTY dolls from the Goetz collection were Kimy, an all-vinyl bath baby from the Kinderland collection; Anna Maria, who, along with her exclusive bear from Steiff celebrates the 100th anniversary of the teddy bear; Thijs, a 23.5-inch sleeping baby by Dutch artist Didy Jacobsen; Baby Evchen, an 18-inch blonde haired baby girl by German artist Elisabeth Lindner; and Holly, the 25.5-inch curly-haired blonde toddler from Hildegard Guenzel’s family of five sisters, her first artist doll collection for the company. The DOTY Industry’s Choice Awards winners and ballot forms for the Public’s Choice Awards will be featured in the June/July issue of Doll Reader. Results of the public polling will appear in the magazine’s October issue. According to Götz, the average Götz doll collector is "in her late 40’s, early 50’s, and has more disposable income than her mother at the same age. She decorates her home with what she collects, buying with an appreciation for durability. She also buys for her grandchildren or her friends’ children. This collector was an early adapter to computers and is willing to research, buy and collect from home or office—sometimes limiting her access to the dolls through traditional shopping in person. The Götz dollmaking factory is located in the small village of Rödental in Bavaria, Germany. The United States subsidiary of Götz is in Radisson Corporate Park in Baldwinsville, New York, where there is a Götz Doll Shop and Visitor Center.